We’ve heard some discussion in EV industry about the implications of GM advertising the Bolt’s pricing as “$30,000 after incentives” and in contrast, Tesla is talking about the Model 3’s starting price as being “$35,000 before incentives”. Anyone in the US who mildly follows the EV scene is aware of the $7500 Federal tax credit that is awarded to new EV buyers. On top of that, US States contribute anywhere from $0 to $6000 more in tax incentives as well as other things like riding in carpool lanes and other niceties. For the sake of simplicity, it would be best for GM to stick to the price before EV incentives when talking about the Bolt, but in Tesla’s case, it’s not just about simplicity. There’s a real risk that some, if not most early Model 3 buyers in the US will simply not have access the $7,500 Federal tax credit. Under the current program, it runs out after 200,000 sales per maker from the program’s start in 2009. Then it tapers off quickly over one year after reaching the threshold. 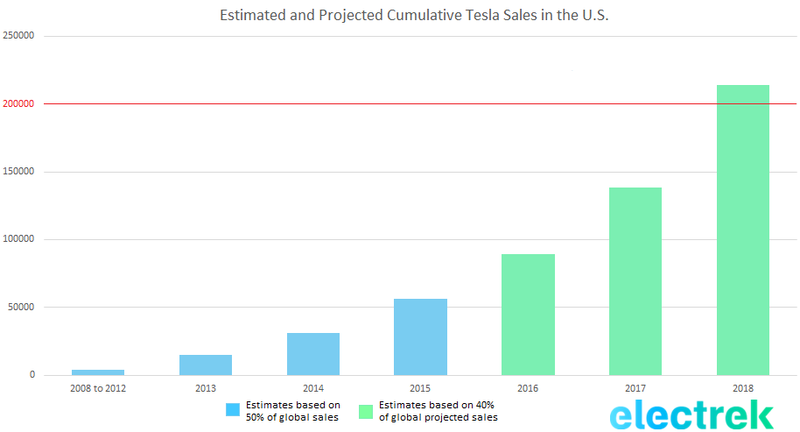 It’s difficult to estimate exactly when Tesla will it the threshold since the automaker rarely breakdown its sales per market, but I’ve put together a projection that should be fairly accurate. It depends on how fast Tesla will be ramping up its production and how strong of a market the U.S. will remain in the near future for the company, but I feel confident that Tesla should hit the 200,000 cumulative sales mark in the U.S. during the second half of 2018. The US Law states that after 200,000 is reached, customers will receive $3,750 for the following 6 months with no apparent limit on units. The following 6 months after that, only $1,875 will be awarded to car buyers. That means that for most of 2019 Tesla buyers won’t likely have much federal incentive to buy cars. By 2020, the Federal Subsidy will have run out. We are assuming that the program will not get an extension, but whether or not that happens will depend largely on the political climate which will be decided at the elections in the US this year. Since it is a big unknown, let’s assume it doesn’t get extended and runs out when Tesla sells its 200,000th US electric vehicle. What are the implications for the Model 3? If Tesla brings the Model 3 to market on time in late 2017, it will mean that buyers will profit from the federal tax credit for just about one year before it runs out. Now the important question is: how fast will Tesla sellout the first year of Model 3 production? It’s anyone’s guess and you can answer our poll below to make yours, but here at Electrek, we all agree that the first year of production will get booked fairly quickly in the reservation process. As Seth wrote this morning, with a lower than expected required deposit of just $1,000 and the strategy of first allowing in-store reservations on March 31st and then online the next day, Tesla could create an iPhone-like buzz around the product and spur early reservations. Of course, it will all depend on what Tesla will show at the Model 3 unveiling next month, and CEO Elon Musk said that he has yet to decide if he wants to show “all his cards” right away, but I honestly wouldn’t be surprised if Tesla manages to get 100,000 reservations by the end of the year and sellout the first full year of Model 3 production a year before its market introduction. We want to know your opinion about this so please vote in the poll below and share your thoughts in the comment section.